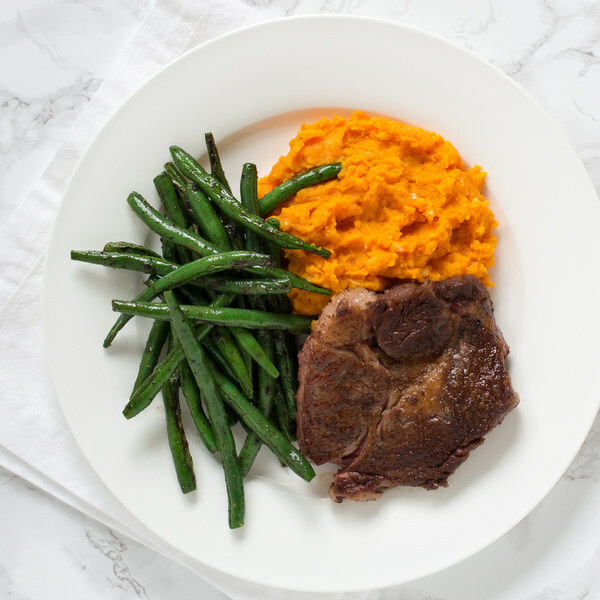 ← Pan-Fried Steak with Sweet Potato Mash & Green Beans. Peel and cut the sweet potatoes into 1-inch cubes; transfer to a medium saucepan. Add water to the saucepan, covering the potatoes, and bring to a boil. Cook until they are tender when pierced with a fork, 8 to 10 minutes. Trim and discard the ends of the green beans; transfer to a medium bowl. Once the steak has been transferred, add the green beans to the skillet and season with salt and pepper. Cook, tossing frequently, until they are bright green and tender-crisp, 3 to 4 minutes. Once done, remove the skillet from the heat. Once the potatoes are tender, scoop out ½ cup of the water and set aside, then drain the potatoes in a colander and return them back to the saucepan. Add the reserved cooking water, minced garlic, butter, salt, and pepper to the potatoes; mash with a potato masher (or a fork) until smooth. To serve, divide the steak, sweet potato mash, and green beans between plates. Enjoy!